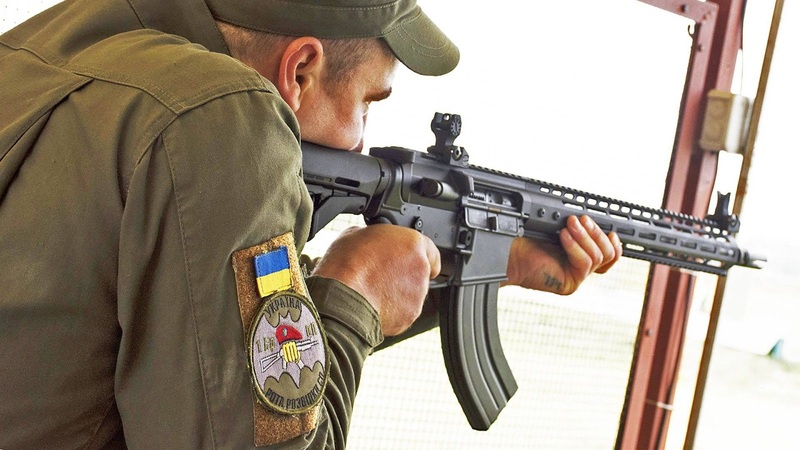 KIEV, Ukraine -- The Ukrainian military has received the first of its new US-made WAC-47 rifles, a derivative of the American-designed M16 rifle that chambers the Soviet-era 7.62x39mm cartridge. Ukraine is primarily looking to get the guns as part of a push to modernize its forces and to make it easier for its troops to work together with foreign units, especially members of the NATO alliance, but in doing so they're also sending a clear political message to Russia. In a New Year’s statement on Jan. 3, 2018, Ukraine’s central state arms company, UkrOboronProm, or UOP, announced it had delivered the initial batch of WAC-47s to unspecified units by way of American firm Aeroscraft. Ukrainian officials first revealed plans to purchase the rifles in January 2017 and the country expects to eventually issue the guns across both its active and reserve military units and to personnel in other state security services. It would be an important upgrade for these organizations, which use dated variants of the legendary Kalashnikov AKM pattern as their primary service rifles at present. “The first batch of WAC-47 … will go into trial operation in the combat units of Ukrainian army,” UOP said in an earlier press release about the project in October 2017. UOP said it delivered these trial guns in a carbine configuration, known specifically as the M4-WAC-47. These weapons appeared to have 16-inch long barrels, though, unlike the 14.5-inch barrels on standard U.S. military M4s. The trade-off is always that a weapon with a shorter barrel might be handier, particularly for troops who have to get in and out of aircraft and other vehicles or otherwise operate in confined spaces, but it will also be less accurate, especially at longer ranges. The guns do appear to share the same basic operating mechanism as their American cousins, though. This so-called “direct impingement” system siphons propellant gas from the barrel as the gun fires to directly cycle the action. Both the AKMs and some newer derivatives of the M16 pattern use a physical piston, which helps keep particulate matter from building up on critical components and causing the weapon to jam. As such, the new M4-WAC-47s weapons will require more cleaning and routine maintenance than Ukrainian troops are likely used to with the notably simpler AKM-pattern guns. This will almost certainly require changes in training regimens and standard operating procedures to make sure Ukrainian troops take care of the new guns properly. A lack of understanding about the M16's cleaning and maintenance requirements, coupled with inaccurate sales pitches, poor quality control, and a change in the formulation of the gunpowder inside the cartridges, turned into an infamous scandal when U.S. troops in Vietnam first began to receive significant quantities of the rifles in the 1960s. The M4-WAC-47s also have the same style of controls, such as the charging handle, fire selector, and magazine release, as M16 pattern firearms. Photos of the prototype rifles show them with handguards featuring both U.S. military standard accessory rails and additional attachment points using American manufacturer Magpul’s M-LOK system. The rifles also had pistol grips and retractable buttstocks from Magpul. Older AKM-based designs have notably limited space for installing similar systems so a user can rapidly attach grenade launchers, optics, laser aiming devices, flashlights, and other accessories. As such, the M4-WAC-47 could quickly offer Ukrainian troops additional capabilities with a minimum of effort, but only as long as the government in Kiev also purchases sufficient numbers of those ancillary systems. The most significant feature, though, is that the M4-WAC-47 uses the aforementioned 7.62x39mm cartridge. Most military M16 pattern weapons typically chamber the smaller 5.56x45mm round. That’s not to say this type of caliber conversion – which can be as simple as adding a new barrel, bolt and carrier assembly, and magazine – is new. The ubiquity of the Soviet-developed cartridge, its heavier bullet, and the popularity of the M16 pattern design have long made the idea of such a combination attractive, particularly to civilian shooters. In the early 2000s, U.S. Special Operations Command (SOCOM) also expressed an interest in the idea. The underlying concept was that American special operators might end up conducting extended missions in areas with limited support where it might be easier to source 7.62x39mm ammunition. It would also improve their ability to work closely with local forces armed with AKMs or other similar guns chambered in that round, something American special operators had done extensively in the opening phases of the war in Afghanistan. Since the Vietnam War, special operations forces, advisers, and even regular troops have often just carried AK type rifles they had captured or otherwise acquired for a variety of reasons, too. SOCOM subsequently crafted a requirement for a weapon that its personnel could easily convert from one caliber to another, known as the Special Operations Forces Combat Rifle, or SCR. One of the firms who submitted designs was Knight's Armament Company, which crafted an M4 carbine derivative known as the SR-47, which not only used the larger cartridge, but would accept standard AKM magazines. In the end, SOCOM decided that the ability to use locally sourced or captured ammunition wasn’t important enough to warrant the cost and effort of buying and issuing dedicated weapons or even conversion kits. The follow-on program, known as the Special Operations Forces Combat Assault Rifle, or SCAR, dropped the 7.62x39mm requirement. Belgian manufacturer FN Herstal ultimately won that competition with a design entirely separate from the M16 pattern. Other manufacturers continued to experiment with and produce M16s chambered in the cartridge, though. At present, there are more than a half a dozen different types commercially available in the United States either as complete rifles or conversion kits. One of the more recent of these is Colt’s Model CK901, an M4 derivative it reportedly developed specifically at the request of the government of Yemen before it collapsed in 2014. The “CK” in this instance stands for “Colt Kalashnikov,” a reference to the AK-series, as the gun not only uses the same round, but also the same magazines, as with the SR-47. UOP said it was this relative modularity that led it to choose the M16 pattern in the first place. The company’s past statements suggest it is also considering building a host of different versions with various barrel lengths, including a 10.5-inch super-compact type and a 24-inch marksman variant, and in additional calibers. The plan is to eventually drop 7.62x39mm entirely and adopt the NATO standard 5.56x45mm. Though Ukraine isn’t part of the alliance, it regularly trains with other countries that are and has deployed troops in support of the bloc’s missions, such as its operation in Afghanistan. In 2009, Ukrainian authorities also agreed to form a combined brigade with Lithuanian and Polish troops, both NATO members, ostensibly to cross train for peacekeeping and humanitarian operations. According to UOP, having M16 pattern weapons will ease in the overall transition to NATO-standard ammunition, weapons, and other equipment. As stocks of 7.62x39mm ammunition run out and troops send their guns in for routine armorer- or depot-level maintenance, technicians would swap out the appropriate parts and return them in a 5.56mm configuration. The Ukrainian military could use the same procedure to retire the smaller Soviet-developed 5.45x39mm cartridge, which it also uses to a lesser degree. But for Ukraine, the WAC-47’s potential multi-caliber nature is inherently political, as well. UOP makes it clear that the new guns are as much about modernizing their military as they are about cutting away the last links to the old Soviet Union and post-Soviet Russia. Ukraine and Russia have been embroiled in a serious conflict since 2014, when the Kremlin seized the Crimea region and began actively supporting separatists seeking to break away from the government in Kiev. This all followed a popular political uprising that ousted Ukraine’s previous Pro-Russian President Viktor Yanukovych. Though the two countries are not openly at war, by all accounts Russian troops have been actively engaged in fighting with Ukrainian troops on Ukrainian soil as part of a complex, hybrid war. “For our country and the Ukrainian army, M16 production in Ukraine is a real step towards Euro-Atlantic structures,” UOP said in the October 2017 statement. Underscoring these statements is UOP’s partnership with Aeroscraft, a division of Worldwide Aeros Corporation. The firm’s main business is lighter-than-air craft, such as blimps and tethered aerostats. Igor Pasternak, who grew up in Soviet Kazakhstan, first founded Aeros Limited in Soviet Ukraine in 1986, becoming one of the Soviet Union’s first private engineering firms to appear under Premier Mikhail Gorbachev’s Perestroika reforms, according to his company's website. Pasternak subsequently immigrated to the United States in 1993 and has steadily become an outspoken critic of Russian President Vladimir Putin and his policies, especially with regards to Ukraine. In 2016, Worldwide Aeroscraft signed a separate deal with the Ukrainian border guard to supply unspecified surveillance equipment. At the time, Pasternak said this contract was part of the U.S. government’s larger program to provide non-lethal military aid to Ukraine. In December 2017, President Donald Trump’s administration approved a commercial license for the sale of Barrett M107A1 .50 caliber sniper rifles to Ukraine, which seemed to indicate a departure from the policies of President Barack Obama. It's not clear if this was necessarily the case, though. That month there was a separate report that Texas-based AirTronic USA had quietly secured similar approval for the delivery of a number of its Precision Shoulder-fired Rocket Launchers, or PSRL, an upgraded version of the Soviet RPG-7 rocket-propelled grenade launcher, to Ukraine in 2016. If Aeroscraft has actually produced any version of WAC-47 in the United States it would have needed a similar waiver to actually deliver them to Ukrainian troops. Though Trump has often called for better relations with Russia, there is no indication he would’ve necessarily been inclined to block this particular sale or any future ones. The administration has gone back and forth in its tone toward the Kremlin, sometimes criticizing its involvement in conflicts in Ukraine and Syria, its potential support for insurgents in Afghanistan, its intransigence over North Korea, and its aggressive foreign policy. In December 2017, there were reports that Trump was considering a larger lethal arms package for Ukrainian forces that would notably include Javelin anti-tank missiles to help counter Russian armored units in the country. If nothing else, the guns will be an important upgrade over the older AKM types. One can see the M4-WAC-47s as a larger metaphor for shifting American policies toward the conflict in Ukraine and the Ukrainian government’s own desire to develop even closer ties to the United States and Western Europe.